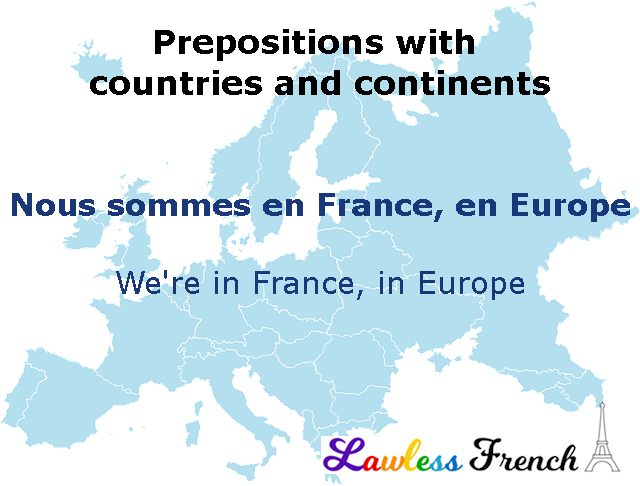 As with other other geographical names, French prepositions with continents and countries depend on the gender,* number, and first letter of the name, plus of course whether you’re coming or going. Je vais au Maroc. I’m going to Morocco. Il est au Honduras. He’s in Honduras. Elle va en Uruguay. She’s going to Uruguay. Nous habitons en Iran. We live in Iran. Ils sont en France. They’re in France. On va en Australie. We’re going to Australia. Tu vas aux États-Unis ? Are you going to the US? Je veux voyager aux Philippines. I want to travel in the Philippines. Je viens du Maroc. I’m from Morocco. Il arrive du Honduras. He’s arriving from Honduras. Elle vient d’Uruguay. She’s coming from Uruguay. Nous rentrons d’Iran. We’re returning from Iran. Ils sont de France. They’re from France. On arrive d’Australie. We’re arriving from Australia. Tu viens des États-Unis ? Are you from the US? Je rentre des Philippines. I’m returning from the Philippines. 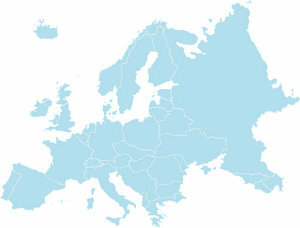 All continents end in –e and are therefore feminine.